Seahawks mailbag: Will the Seahawks have a 1,000-yard rusher in 2018? Will they blitz more? Seattle hasn't had a 1,000-yard rusher since 2014. Could that change this season? Seahawks beat writer Bob Condotta answers that and more as he once again opens his mailbag of reader questions. Will Hawks have a 1000 yard back this year or will they have a committee? Last year the idea was to go with the hot hand, with little success. Is it better to just feature one back? A: I actually don’t think the plan going into the 2017 season was necessarily to go with the hot hand instead of setting on one running back, it just sort of appeared that way given how things worked out. True, the Seahawks went into the season with what seemed almost a surplus of tailbacks with a supposedly healthy and revived Thomas Rawls, free agent signee Eddie Lacy and the quickly emerging Chris Carson. Carson was the best of the bunch in camp, but the Seahawks — for understandable reasons — weren’t going to just give up totally on Rawls and Lacy early in the season and also wanted to ease in Carson a bit, so Lacy and Rawls each remained in the plans heading into the season. But after the first game, when it became clear Carson was playing the best, the Seahawks handed him the job — he got 42 of the 55 carries allotted to tailbacks in the next 11 quarters of games two, three and four until he was injured midway through the fourth quarter of the fourth game against the Colts and ultimately lost for the season. It was Carson’s injury more than than anything else that altered the course of Seattle’s tailback position in 2017. With Carson out, the Seahawks went back to Lacy. But he proved ineffective, which led to going back to Rawls, who likewise struggled. The Seahawks were undoubtedly looking for the hot hand there, but had someone proven to have a hot hand, they would gladly have stuck with that tailback. Instead, the continued struggles of Lacy and Rawls led to a merry-go-round that eventually settled on Mike Davis. That’s a maybe long-winded way of saying I think the Seahawks didn’t so much as have a plan to go with the hot hand as they simply didn’t have much choice but to keep rotating guys in the hope that someone would take the job and run with it. Now healthy, Carson appeared the clear number one ending minicamp and if he stays healthy through training camp, I’d imagine he’ll be the starter going into the season. And if he then could do what he did in the first four games last season — recall that he averaged 4.2 yards per carry, which was better than the likes of Leonard Fournette (3.9), Le’Veon Bell (4.0) and Ezekiel Elliottt (4.1), to name a few — he could well top the 1,000-yard mark, something no Seahawk has done since Marshawn Lynch with 1,306 in 2014. 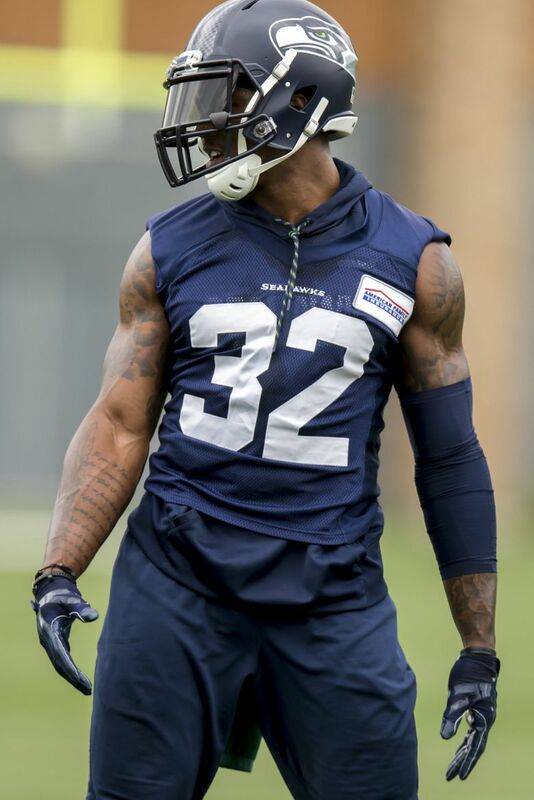 I can already hear the question back — so why’d Seattle spend a first-round pick on a tailback (Rashaad Penny) if it may well have already had a so-called bellcow back on the roster already in Carson? Seattle’s recent injury history at the position is the main answer. Seattle’s running back in injury issues really date to the third game of the 2015 season when Lynch got hurt against the Bears. Rawls for a while was a more-than-suitable replacement. But it’s obvious in retrospect Rawls was never the same after his broken ankle in week 13 against the Ravens (it may also be worth remembering that Rawls only had six games that season when he had six or more carries, meaning he’d hardly yet established a long track record of durability). The 2016 and 2017 seasons were even more pock-marked with injuries. So as Seattle tried to do last year by adding Lacy and Carson, Seattle is hoping this year to have a good stockpile of available options to get through the inevitable aches and pains of a 16-game regular season. Seattle also has touted Penny’s receiving skills and floated the idea that he could be a legitimate option as a third-down, two-minute back, and also that Penny and Carson could line up together at times. Davis also could factor in as depth and a complementary back and C.J. Prosise and J.D. McKissic also will vie for snaps in some capacity (most likely battling for the third-down back role, though if Prosise can stay healthy he could factor in as an everydown back). But it appears the starting tailback battle mostly comes down to Carson and Penny, with Carson having the upper hand. If he stays healthy, shows he can do what he did last year for four games over 16, and gets a little more help from his offensive line, then a 1,000-yard season isn’t out of the question. A: Of the two factors in your question there, I don’t think the first — the change in coordinators — really plays much of a role. No matter who the coordinator is, the main one calling the shots for Seattle’s defense — and creating the overall foundation of what it will look like — is Pete Carroll. Carroll has now had four different defensive coordinators. Under each of the first three — Gus Bradley, Dan Quinn and Kris Richard — blitz numbers never really varied all that much. Certainly not enough to indicate any real change in philosophy other than needing to do a little more or less in some games based on personnel, matchups and a gameplan specific to that week’s opponent. According to Pro Football Focus, the Seahawks last year blitzed 22 percent of the time, which as I detailed in a story in January was tied with the Eagles for the fifth-lowest blitz percentage in the NFL, ahead of only the Chargers, Jacksonville, Bengals and Bills. As I also wrote then, the 22 percent blitz rate of the 2017 season is right in line with what the Seahawks did under Bradley and Quinn — Seattle blitzed 21.35 percent in 2013 when it won the Super Bowl, for instance. And an ESPN story in the middle of the 2016 season stated: “Since 2012, the Seahawks have blitzed — a pass rush of five or more players — on only 25 percent of opposing dropbacks. That’s the sixth-lowest percentage in the league.’’ (I’d also note some variance in numbers from different outlets — PFF and ESPN, in this case — could be due in part to how different outlets define a blitz). So I don’t see the the addition of Norton to the DC role changing the philosophy much. That has been and always will be Carroll’s purview, and Carroll would prefer to be able to get the pressure the team needs with a four-man rush as often as possible and not leave the defense prone to giving up big plays. (So why make a change in coordinators then? I think it was more about the delivery of the message than the message itself). As you correctly note, what could change the equation this year is the pass rush and if the team can get the pressure it needs from the personnel on hand or if it will have to resort to a little more gimmickry to get that done. And that remains one of the biggest questions heading into camp — whether the Seahawks can get the pass rush they need from the likes of Frank Clark, Dion Jordan, Barkevious Mingo, Marcus Smith, Rasheem Green, etc., after losing the likes of Michael Bennett and Cliff Avril. My hunch is Carroll is going to head into the season thinking they’ll have the answers on hand and will adjust accordingly as needed. But I also think the Seahawks will aggressively go after pass rushers who become available as training camp begins. A: Thanks! That’s the hope and plan here, too, as you’ll see a bit less on here for a few weeks before we begin gearing up for the season again in late July.